A zonal and approach to aquaculture planning and disease control has been introduced by Subpesca under the General Fisheries and Aquaculture Law (GLFA) and its subsequent revisions. An amendment to General Law on Fisheries and Aquaculture (GLFA) - Law No. 20.434 (April 2010) strengthened the government’s role in aquaculture inspection and enforcement and led to the creation of an aquaculture subdivision in Sernapesca. There is a strong disease surveillance and reporting system for Infectious Salmon Anemia (ISA), Salmon Rickettsial Septicaemia (SRS) and Calgidosis (sea lice). SalmonChile, a producer organization that represents over 95% of production, has recently launched a Sustainability Report and Database. This includes health and environmental indicators for each member company. The awarding of new licenses was temporarily closed in Aysen, but this moratorium has since been lifted. Three major feed companies publicly disclose their source fisheries and have public commitments to improve the sustainability of their sourcing. Initiate FIPs in poorer performing fisheries that are used for fishmeal and fish oil. Continue to support and expand research and development (R&D) initiatives, particularly those intended to help disease outbreaks and drug resistance. Incorporate hydrodynamic and chemical benthic residue parameters into the environmental regulations for the planning and production aquaculture, including the establishment of Areas Autorizadas para el ejercicio de la Acuicultura (AAAs) and Aquaculture Management Areas (AMAs). Information on production, licensing, disease monitoring and control plans, and management of the industry are publicly available from the Subpesca and Sernapesca websites and reports. Incidents of disease outbreaks of ISA; SRS, also known as Piscirickettsiosis, and sea lice (Calgidosis) are available from Sernapesca’s annual fish health reports (called Informe Sanitario de Salmonicultura en centos marinos). Quantitative and qualitative information on notifiable salmonid diseases - primarily Infectious salmon anemia (ISA) - is available through the World Organization for Animal Health’s (OIE) World Animal Health Information System (WAHIS) and database. Information on the Maximum Residue Levels (MRL) of veterinary drugs and prohibited substances is available from Sernapesca’s - Manual de Inocuidad y Certificación - Safety and Certification Manual. SalmonChile’s Sustainability report/database provides individual company and aggregate member information for the period 2013-2015 on various aspects of health management and control (including mortality rate, sea lice levels, and veterinary & chemical treatments). Information on the government and industry’s zonal approach was provided by a case study in a recent FAO publication (Aquaculture zoning, site selection and area management under the ecosystem approach to aquaculture). Information concerning the environmental impacts and management of salmon culture was provided by a recent Seafood Watch report. Aquaculture is regulated by the General Fisheries and Aquaculture Law (GLFA), which was last modified in 2010 under Law No. 20,434 (Subpesca 2018) . A zonal management approach has been adopted based on licenses (concessions); groups of licenses - Aquaculture Management Areas (AMAs); emergency disease zones - Macro Zones; and Areas Autorizadas para el ejercicio de la Acuicultura - Appropriate Areas for Aquaculture (AAA). AMAs and Macro Zones are nested under AAAs. AAAs were first established in 1991 and they outline areas where all types of aquaculture can be developed (Alvial 2017) . AAAs are developed by Subpesca via a participatory process involving public consultation. Currently, 12 out of 15 regions in Chile have established AAAs and these have been incorporated into each region’s coastal management plans (Alvial 2017) . AMAs - also known as barrios, neighborhoods, or “salmonid groups of licenses”- were first introduced following the ISA crisis and aim to coordinate disease control, particularly sea lice and ISA (Alvial 2017) . AMAs set minimum distances between farms and require farmers to coordinate (synchronize) management and biosecurity measures (Alvial 2015) (Alvial 2017) (Arriagada et al. 2017) . There are currently 37 AMAs in Aysen incorporating 709 concessions (licenses) (Alvial 2015) (Alvial 2017) . Macro Zones, which may include two or more AMAs, focus on emergency fish health responses and only activate in these cases. There are currently three Macro Zones in Aysen (Alvial 2015) . Licensing: Regulations for establishing and operating a salmon farm are provided in the “Regulation for Aquaculture Concessions and Permits” (SD 290/93) (Wilson et al. 2009) . In summary, the licensing system has three main components:1) environmental by the National Commission for the Environment (CONAMA); 2) compliance with the GLFA Law 20, 434/2009 by Subpesca; and 3) compliance with coastal zone management plans on state-owned land by the Undersecretary of the Navy (under the Ministry of Defense) (Alvial 2017). Licenses are awarded by the Ministry of Defense which gives an entity the use rights to a resource for a period of 25 years (Alvial 2015) (Alvial 2017) . The license application process involves consultation with multiple regional stakeholders and public feedback and takes from nine to twelve months (Alvial 2017) . When an aquaculture concession or permit is granted the titleholder receives a certificate, and Sernapesca maintains a national register of aquaculture facilities (Muñoz 2006) (Wilson et al. 2009) . In 2010, a temporary moratorium on new salmon farming licenses in Aysen was introduced (Alvial 2017) (Cardenas 2015) . According to Alvial, (2017), this ban has been lifted (Alvial 2017). The industry receives scientific, technical, and management advice from a variety of sources. Instituto Tecnológico del Salmón (INTESAL), which operates under SalmonChile, as well as research and academic institutions, provide research to inform the industry on the latest technological developments (SalmonChile 2017) (UNCTAD 2006) . Advice is provided via codes of best management practices, voluntary standards, technical training courses, workshops, and reports (UNCTAD, 2006). INTESAL has been instrumental in the development of new regulations and disease control and surveillance programs (UNCTAD 2006) . Fundación Chile operates Aquadvise – a commercial business unit offering services and advice to the aquaculture industry – and the Techincal Center for Food Innovation (CETA) (Fundacion Chile 2017) . Fundación Chile has created more than 40 salmon farming enterprises to demonstrate new technologies, 30 of which have been sold to the private sector (UNCTAD 2006) . Water Quality: The monitoring of soluble effluent in the water column is not required in Chile (Bridson 2017) . Instead, the monitoring of sites focuses on the assessment of benthic conditions. According to the Framework Law on the Environment (FLE) No. 19.300 (1994), aquaculture activities are subject to a mandatory environmental assessment by the National Commission for the Environment (CONAMA). Environmental Impact Assessments (EIA) can be submitted as either an Environmental Impact Study or a Declaration of Environmental Impact (DIA) (Muñoz 2006) . DIAs are used when there is a lower potential impact (Wilson et al. 2009) . The Environmental Regulation on Aquaculture 12, RAMA (SD 320/2001), focuses on the prevention and assessment of the aerobic conditions of the benthos and the preparation of a Preliminary Characterization of Site (PSD) for all water column and benthic lot projects that are submitted to SubPesca. Health Management: Sernapesca’s animal health unit is responsible for management of aquatic diseases (Sernapesca 2017) . Sanitary Regulations for Aquaculture (RESA), S.D. No. 319 (2001), have established regulations concerning protective measures, control, and eradication of diseases that are high risk to aquatic species. Following Res Ex. N ° 1741 - 09.07.2013, Sernapesca has established an active surveillance program for high-risk diseases (Sernapesca 2013) . Following, Resolución Exenta N° 1141 del 18 mayo del 2012 (updated 2015), a new sea lice surveillance and control program has been established which requires weekly assessments (Arriagada et al. 2017) (Sernapesca 2012) . AMAs are subject to coordinated resting periods set by Sernapesca (Alvial 2017) . Farms that are producing the same species should be a minimum of 1.5 miles apart (Alvial 2015) . Disease Control: Following initial outbreaks of ISA in July 2007, Sernapesca established a surveillance and control program and issued several resolutions establishing contingency and control measures. AMAs are subject to coordinated treatment and control of sea lice, including the rotation of bath and oral in-feed treatments to reduce resistance (Alvial 2017) . Sernapesca has produced best practices on anti-parasite chemical use (in the "Manual buenas practicas uso antibioticos antiparasitarios"). These include guidance on dosage, grace period and administration of a range of veterinary drugs for both sea lice and infectious diseases (Sernapesca 2011) . The Ministry of Health is responsible for setting MRLs for pharmacologically active substances under Resolution No 1462 of 25 February 1999 (European Commission 2011) . For aquaculture, Sernapesca can apply MRLs in order to comply with market export requirements and is responsible for monitoring aquaculture products (European Commission 2011) (European Commission 2016) . Export certificates regarding the sanitary quality of product are required (Sernapesca 2017) . Chemical Benthic Residues: Sernapesca’s best practices on anti-parasite chemical use recommend that farm-level benthic and water column standards for veterinary and anti-sea lice drug levels are established (Sernapesca 2011) . Water Quality: No management thresholds are set for water quality. Health Management: Health programs for the monitoring and control of ISA, sea lice and Piscirickettsiosis/ SRS have been established (Sernapesca 2016) . Suspicion or detection of either infectious ISA or SRS at a site triggers compulsory biosecurity measures (Sernapesca 2016) . Resolution 1577/2011 outlines a surveillance and control program for ISA. In the case of sea lice and SRS, surveillance and control measures involve sites being classified as either ‘Alert’ or ‘High Dissemination Centers (CAD)’ (Sernapesca 2016) . Sites recording a sea lice load of ≥3 gravid females in the first week following an officially established treatment period are classified as CAD and are subject to mandatory controls (Sernapesca 2015) (Sernapesca 2016) . Disease Control: MRLs for a list of pharmacologically active substances for product destined for Chile, the European Union, Japan, and China are outlined in Table 3 of Section 1 of Sernapesca's Safety and Certification Manual (Sernapesca 2018) . Prohibited substances include chloramphenicol, esteroides (17β-estradiol), estilbenos, nitrofurans, nitroimidazoles, violet crystal, and malachite green (Sernapesca 2018) . For sea lice, synchronized treatments within AMAs are optional unless farms record >9 mobile lice per fish and neighboring farms within 5 nautical miles’ record >6 mobile lice per fish; in these cases, synchronized treatment is mandatory (Arriagada et al. 2017) . Authorized commercial treatments for sea lice are deltamethrin 1%, diflubenzuron 80%, emamectin benzoate 0.2%, and cypermethrin 5% (Ibieta et al. 2011). There is a maximum of three immersion treatments during a production cycle (Sernapesca 2016) . The MRLs of these substances in export markets are provided by Sernapesca’s best practices on veterinary drug use (Sernapesca 2011) . Chemical Benthic Residues: Despite Sernapesca’s best practices on anti-parasite chemical use that call for farm-level benthic and water column standards for veterinary and anti-sea lice drug levels to be established (Sernapesca 2011) , there is no information on acceptable benthic residue levels or environmental quality standards. A lack of government inspection and enforcement efforts was acknowledged to have been a major factor contributing to the ISA crisis of 2007-2009 (Wilson et al. 2009) . Following this, increased sanctions for non-compliance were introduced along with an increase in the number of inspection staff (Alvial et al. 2012) . Licenses can be terminated due to a single severe non-compliance with license requirements (e.g. such as the culture of a different species, genetically modified organism (GMO) or exotic species without authorization) or if there are three sanctions over a period of two to three years (Alvial 2017) . Sernapesca provides details of judicial and administrative sanctions levied for aquaculture infringements from 2008-2013 (Sernapesca 2013) (Sernapesca 2013) . During this period, there were six judicial sanctions in Aysen (of 36 nationally). There is no further compliance information available after 2013. Disease Control: The majority of the judicial sanctions nationwide involved violations of health management and disease control measures (Sernapesca 2013) . Water Quality: Site assessment focuses on benthic conditions, with 20% of sites classified as anaerobic nationwide in 2016 (Sernapesca 2017) . Health Management: In Aysen in 2014, 18.6% and 2.4% of sites classified were classified as Alert and CAD, respectively, for SRS/Piscirickettsiosis. In 2015, these figures were 27.8% and 3.1% (Sernapesca 2016) . Infection with HPR-deleted ISAv (an OIE notifiable disease) was recorded once in Aysen in 2014, 2015, 2016 (World Organisation for Animal Health (OIE) 2017) , as well as 38 cases of infection with HPR0 ISAv in 2015 (Sernapesca 2016) . From 2014-2015, sea lice levels in Aysen ranged from around 0.5 to 2.0 adult lice per fish (Sernapesca 2016) . At the national-level, SRS has accounted for more than 69% of total Atlantic salmon disease mortalities annually in most years since 2011 (Sernapesca 2011) (Sernapesca 2013) (Sernapesca 2014) (Sernapesca 2015) (Sernapesca 2016) . Other diseases of concern include Infectious Pancreatic Necrosis (IPN) and Bacterial Kidney Disease (BKD). In 2015, the average level of sea lice per fish for SalmonChile member companies was 2.78, which is almost 50% less than 2013 levels (SalmonChile 2017) . From 2014-2015, the number of sites classified as CAD for sea lice nationwide ranged from <5 to around 30 (around 1-12%) (Sernapesca 2016) . Disease Control: Nationwide, antimicrobial use increased to 590 g/mt in 2014 (Sernapesca 2015) . Florfenicol and oxytetracycline account for 99% of antimicrobial use, primarily used in the treatment of SRS (Sernapesca 2017) . Aysen and Los Lagos accounted for 95% of antimicrobial use, while only 5% was used in Magallanes (Sernapesca 2017) . Aggregate data for Salmon Chile members indicates that 516 g/mt of antibiotics and 6.2g/mt of parasiticide were used in 2015 (SalmonChile 2017) . The European Commission’s (EC) Rapid Alert System for Food and Feed (RASFF) lists a few recent notifications concerning oxytetracycline levels in frozen Atlantic salmon fillets from Chile above MRLs for export destinations (classified as undecided) (European Commission 2018) . Chemical Benthic Residues: Sernapesca's Informes Sanitarios y Ambientales Acuicultura (INFA) website classifies aquaculture sites as aerobic or anaerobic from 2010-2017 (Sernapesca 2017) . However, there is no indication of chemical benthic residues. Water Quality: Site assessments rely on benthic analysis as opposed to the water quality assessments. From 2010-2015, the percentage of salmonid sites classified with benthic anaerobic conditions in the immediate vicinity of cage sites nationwide increased from 3% in 2010 to 20% in 2013. This was followed by a decrease to around 16-17% in 2014 and 2015, and 19% in 2016 (Sernapesca 2016) (Sernapesca 2017) . Health Management: Outbreaks of ISA and sea lice have decreased significantly since peaks in 2007 and 2008, and farm performance indicators are now surpassing pre-ISA crisis levels. From 2014 to 2016, several incidents of infection with either the HPR-deleted or HPR0 genotypes of ISAV have been recorded nationally. However, HPR0 ISAV has never been associated with ISA in Atlantic salmon​ (World Organisation for Animal Health (OIE) 2017) . From 2007-2010, sea lice levels nationwide declined largely due to a fall in production caused by the ISA crisis (Hindar 2014) . This was followed by an increase in sea lice levels from 2011-2013 (Sernapesca 2013) (Sernapesca 2014) . From 2014-2015, average weekly numbers of adult sea lice per fish have remained fairly constant in Aysen and below threshold levels (Sernapesca 2016) . Disease Control: From 2005-2010, the use of the anti-parasitic drug emamectin benzoate decreased nationwide, but the use of diflubenzuron and deltamethrin increased. Cypermethrin use was not recorded before 2010 (Ibieta et al. 2011) . Total antibiotic use fell after reaching a peak of 385,000 kg nationwide in 2007 (Ibieta et al. 2011) . Since this time, aggregate figures from SalmonChile members suggests that antibiotic use has remained stable for 2013-2015 at around 520g/mt and pesticide use has remained stable at 6.2 g/mt (SalmonChile 2017) . Chemical Benthic Residues: No information available. In October 2010, SalmonChile signed an agreement with GloblaGAP to launch a standard known as SALMONGAP - intending to improve salmon production and processing by incorporating issues such as feed, health, safety, quality environmental issues and working conditions (Ibieta et al. 2011). However, the current status of this standard is unknown. Water Quality: No information available on improvement plans. Health Management: Authorities are considering new regulations that would modernize how licensed production limits are set. Under the proposed regulations, producers would be able to opt for either a maximum allowable net-pen density below the current limit of 17 kg/m3 or vary the net pen density limit according to the health status of the fish (without exceeding the current maximum) (Villegas 2016). The new system aims to increase profitability and reduce the costs associated with disease treatment. The new regulations were anticipated in 2017, but there is no indication that they have been implemented yet. Research into SRS vaccines also continues (Villegas 2015) . Under Sernapecsa’s new program for the surveillance and control of sea lice, the use of non-pharmacological control strategies is encouraged but recommended non-pharmacological approaches are not detailed (Sernapesca 2015) . Disease Control: In 2014, Marine Harvest Chile in partnership with Fundación Chile began a project to develop the use of the native species róbalo (Eleginops maclovinus) as a cleaner fish and an alternative to chemical sea lice treatments (Stewart 2014) . In January 2015, Sernapesca published a new version of the “Program Sanitary Specific for Surveillance and Control of Caligidosis”. Under this program, the monitoring of sea lice switched from the assessment of total adult sea lice to the number of gravid female lice per fish. The definition of CAD center also changed to mean sites recording ≥3 gravid female sea lice one week after the end of treatment. Sites classified as a CAD center three consecutive times are now subject to the same biosecurity measures as those imposed for SRS and ISA (Sernapesca 2016) . The regulatory system addresses risks to and from aquaculture through a zonal approach to siting, licensing, and production management. License requirements are published and Sernapesca maintains a national register of aquaculture facilities and reports on the number of active and registered sites in its aquaculture statistical yearbooks (Sernapesca 2013) (Sernapesca 2014) (Sernapesca 2014) (Sernapesca 2015) (Sernapesca 2017) . The results of EIAs for fishery and aquaculture enterprises are available from the Ministerio del Medio Ambiente - Ministry of the Environment and its Sistema de Evaluacion de Impacto Ambiental (SEIA) database (Ministerio del Medio Ambiente (MoE) 2018) . Maps of the various aquaculture zones and farm locations are available from Sernapesca. There is evidence that a participatory approach is taken to aquaculture zoning (Alvial 2017) . All farms need to have an aquaculture concession or license to operate (Alvial 2015) . According to the Framework Law on the Environment (FLE), No. 19.300 (1994), aquaculture activities are subject to a mandatory EIA assessment by CONAMA, which are submitted as either an Environmental Impact Study or a Declaration of Environmental Impact (DIA) (Muñoz 2006) . AMAs and Macro Zones are nested under AAAs which were established under the GLFA - No.18.892 (1989). The AAA outline areas where all types of aquaculture can be developed and have been incorporated into each region’s coastal management plans (Alvial 2017) . Farms require a survey of the benthos to determine the carrying capacity of the site, a fish health management plan, and biosecurity and risk analysis (Alvial 2015) . The process for license application and AAA establishment is subject to public consultation; however, this is not the case for the creation of AMAs as they are viewed primarily as a disease control (and therefore internal) issue (Alvial 2017) . Licenses can be terminated if there are repeated environmental infringements or anti-union actions (Alvial 2017) (Alvial et al. 2012) . Online details of judicial and administrative sanctions levied for aquaculture infringements are available from Sernapesca for 2008-2013 (Sernapesca 2013) ; however, there is no data more recent than 2013. In 2010, authorities imposed a temporary moratorium on new salmon farming licenses in Aysen and other major producing regions (Alvial 2017) ; however, this moratorium is no longer active in Aysen (Alvial 2017) . The presence of an active producer organization representative of the whole industry and establishment of a Code of Good Practice. There is no information on the status of previous CoGP initiatives such as Fundacion Chile’s Código de Buenas Prácticas Ambientales (CBPA), SalmonChile’s SALMONGAP, or the Integrated Management System of the Salmon Industry (SIGES) (Fundacion Chile 2003) (Ibieta et al. 2011) . The major producer associations, SalmonChile and Fundacion Chile, are identifiable (Fundacion Chile 2017) (SalmonChile 2017) . The SalmonChile website provides the names of member companies (and relevant links) (SalmonChile 2017) . It also reports on its members’ adherence to international certification standards via its sustainability report/database (SalmonChile 2017) . Some SalmonChile members (e.g. AquaChile, Australis Seafoods, Blumar, Camanhaca, Cermaq Multiexport Foods & Ventisqueros) are also part of the Global Salmon Initiative (GSI), which has made a commitment that all members will adopt the ASC standards by 2020 and provides data on the current adherence (GSI 2018) . SalmonChile members represent 95% of domestic production; however, it is unclear what percentage of producers this represents and whether both small and large producers are members (SalmonChile 2017) . The Chilean members of GSI are predominantly large producers (GSI 2018) . GSI members are bound by its commitment that 100% of members will be ASC certification by 2020 (GSI 2018) . Current ASC salmon standards set out farm-level BMPs, as well as require farms to participate in area-based approaches to manage disease and parasites or abide by existing area-based regulations (ASC 2018) . SalmonChile and Fundacion Chile membership rules are not available, so it is unclear whether these organizations require members to become certified or adhere to any form of CoGP. However, producers who are part of the Global Salmon Initiative (GSI) are bound by its commitment to have all members ASC certified by 2020. The impact of aquaculture on the quality of public water resources is managed. There is no public available data on water quality for public water bodies or farms. There is no information on water quality standards for waterbodies or farm-based effluent limits. Sernapesca is the management body responsible for the fisheries and aquaculture sector and protection of water and biological resources. However, no enforcement measures regarding infringements of water quality can be identified as the monitoring of soluble effluent in the water column is not required in Chile and the industry focus is on benthic assessments (Bridson 2014) (Subpesca 2016) (Subpesca 2017) . Industry is protected from catastrophic losses through best practice disease management on farm and at the zone level. The Department of Animal Health, operated under Sernapesca, produces annual salmon culture health reports that detail outbreaks of ISA, SRS, and levels of sea lice for the main salmon producing regions. These include levels of sea lice for Aysen and Los Lagos for 2014 & 2015 (Sernapesca 2016) . They also include maps of sites identified as High Dissemination Centers (CAD) for SRS and sea lice for Aysen and Los Lagos in 2015 (including Macro Zones) and special cases for ISA (Sernapesca 2016) . Aggregate mortality data by production species is available for Aysen, Los Lagos, and Magallanes. SalmonChile’s sustainability report and database provide individual company and aggregate member information on various aspects of health management and control from 2013-2015 (including mortality rate, sea lice levels, and veterinary and chemical treatments) (SalmonChile 2017) . According to the GLFA the introduction of any living aquatic species requires a health certificate (D’Andrea 2005) . Following Res Ex. N ° 1741 - 09.07.2013, Sernapesca has established an active surveillance program for high-risk diseases (Sernapesca 2013) . These include programs for the control and surveillance of ISA, SRS and sea lice (Sernapesca 2013) (Sernapesca 2017) (Sernapesca 2017) (Sernapesca 2017) . Under the GLFA, AMAs - also known as barrios or neighborhoods or “salmonid groups of licenses”- have been established. These set minimum distances between farms and require farmers to coordinate (synchronize) management and biosecurity measures (Alvial 2015) (Alvial 2017) (Arriagada et al. 2017) . There are currently 37 AMAs in Aysen incorporating 709 concessions (licenses) (Alvial 2015) (Alvial 2017) . There is evidence of the establishment of Macro Zones for sea lice and SRS in 2015 (Sernapesca 2016) . Sanitary reports and research surveys for ISA, coordination treatment windows, details of CAD centers for sea lice, and a 2013 report on the monitoring and control of SRS are all available via Sernapesca’s website (Sernapesca 2013) (Sernapesca 2017) (Sernapesca 2018) (Sernapesca 2018) . Online details of judicial and administrative sanctions levied for aquaculture infringements are available from Sernapesca for 2008-2013 (Sernapesca 2013) . The majority of judicial sanctions during that time were due to fish health-related issues. Sernapesca’s most recent health report of salmon culture in marine centers indicate that 9 Macro Zones were established in Aysen in 2015 for SRS (3), ISA (3), and sea lice (3), which indicates a high prevalence of these diseases. General mortality rates range from around 1-2%. Although sea lice levels for Aysen are below threshold levels, there are a number of sites that were classified as 'Alert' or 'CAD' for SRS in 2014 and 2015 indicating a high frequency of occurrence for SRS. (Sernapesca 2016) . The fishmeal and oil in aquaculture feed is sourced from well managed or improving fisheries. The major feed suppliers are identifiable and include Biomar S.A, Cargill/EWOS, Nutreco Chile/Skretting S.A, and Vitapro, Chile. S.A (SalmonChile 2017) . BioMar, Cargill, and Skretting identify source fisheries and publicly report on their own improvement processes in their annual sustainability reports (BioMar 2017) (EWOS 2015) (Nuterra 2017) . BioMar, Cargill, and Skretting have published commitments to improving marine feed source ingredients and report progress against their commitments publically through their annual sustainability reports (BioMar 2017) (EWOS 2015) (Nuterra 2017). FS scores for all identifiable source fisheries are available via the Ocean Disclosure project (SFP 2017) . Not all FS Scores, including FS Score 4 -Current Health, are ≥6. For example, Anchoveta – Chilean central-southern- seine nets has a Current Health score of 3.8 and a Fishers Compliance score of 0. Sandeels nei –SE North Sea has a Current Health score of 4.6; while sandeels nei – Viking and Bergen banks has no score for current or future health. Anchoveta – southern Peru/Northern Chile – seine net has a Future Health score of 0. Most of the fisheries noted here are also not in a FIP. To see data for Production, please view this site on a desktop. To see data for Disease Reporting, please view this site on a desktop. No information on water quality data collection and reporting is available. There were three outbreaks of ISA in Aysen in 2013 and one in 2015. In 2015, there were also 38 confirmed cases of infection with HPR0 ISAV - a strain of the infectious salmon anemia virus that has never been associated with ISA in Atlantic salmon (World Organisation for Animal Health (OIE) 2017) . Diseases reported to OIE included ISA (2010, 2012, 2013), 14 cases of HPR0 ISA in 2014, and multiple cases of HPR-deleted ISA in 2014, 2015 and 2016. Infection with HPR-deleted ISAC may cause ISA in Atlantic salmon. Sea lice infestations from 2014-2015 ranged from 1-2.25 adult lice per fish in Aysen (Sernapesca 2016) . These values are below the management threshold of 3 gravid females for the first week following an official establishment treatment period and, as such, none were classified as an 'outbreak'. To see data for Certified Farms, please view this site on a desktop. The information presented here is based on publicly available information from the respective certification websites. The unit of certification varies between the different Certification schemes. For ASC, we report only the number of farms that are listed as certified on their website. We do not include farms that are in assessment. For BAP, we report only the farms that are certified. We do not include hatcheries, processing facilities, or farms in the iBAP program. For GlobalG.A.P., we report the number of fish farming companies that are certified. The number of farms operated by companies certified by GlobalG.A.P is not publicly available. We do not include certified companies that only operate hatcheries. The ASC does publish certified production volume by country, but data is not available at the province/state level. Information presented here is manually compiled from publicly available certification audits on a semi-annual basis. Certified production volume data is not publicly available from BAP or GlobalG.A.P. More than 90% of Chilean salmon farming occurs in Regions X (Los Lagos) and XI (Aysén), with the remainder occurring in Region XII (Magallanes) (Sernapesca 2016) . The Aysén Region is located in Chile’s northern Patagonian Fjords, composed of a system of islands, channels, and fjords. The Fjord system is considered as one of the most complex estuarine systems in the world and is home to World Biosphere Reserves. Despite a low population density, the northern Aysén region of the Patagonian Fjords is defined by there is high demand for the use of coastal areas for fishing, aquaculture, and tourism (Molinet et al. 2014) . Chile produces most of its salmon eggs domestically; the use of imported eggs has declined steadily since 2008 due to tighter controls to reduce disease risk (Dempster 2011) (Ibieta et al. 2011) . All eggs come from domesticated broodstock, selectively bred over many generations to improve growth rate, disease resistance and other traits (UNCTAD 2006) . The history of the Chilean salmon farming industry consists of two major periods: 1) pre-ISA crisis and 2) post-ISA crisis. Prior to the crisis, the Chilean salmon industry grew dramatically in Regions X (Los Lagos) and XI (Aysen) (FAO, 2014). The ISA crisis in 2007-2009 caused major production losses, farm closures, and other significant economic and social impacts (Alvial et al. 2012) (Ibieta et al. 2011) . As a result of the ISA crisis, production fell by almost 70% to 123,233mt in 2010. Since 2010, production has rebounded. Although ISA appears to have been effectively controlled in part due to new biosecurity measures, recent increases in salmon production have been accompanied by an increase of SRS outbreaks, antibiotic use, problems with sea lice, and recent calls for authorities to reduce production levels (Sernapesca 2015) (Sernapesca 2016) (Villegas 2015) . A re-distribution of farms as they gradually moving southwards is also notable. In 2007, 72% of active salmon farms were located in Los Lagos, 27% in Aysen, and 1% in Magallanes (Alvial et al. 2012). However, by 2015 43% were located in Los Lagos, 49% in Aysen and 9% in Magallanes (Sernapesca 2016) . General Law on Fisheries and Aquaculture (GLFA) (Ley General de Pesca y Acuicultura, 1989, Law No.18.892) - Sernapesca and SubPesca - Regulation of Chilean aquaculture, including establishing of licensing and area-based management systems. GLFA Law No. 20.434, Modifies the General Law of Fisheries and Aquaculture, in the Matter of Aquaculture (FDO 08/04/2010) - SubPesca and Sernapesca - Created the Aquaculture Subdivision in SERNAPESCA and reinforced SUBPESCA’s National Direction of Aquaculture. Strengthens the government’s role in inspection and enforcement and distinguish aquaculture activities from fisheries activities. New aquaculture legislation concerning coordination of farms to reduce health risks, setting limits to stocking density, preparation of env reports by third parties, drug regulations, macro zone establishment to contain diseases, cancellation of concessions if environmental reports are negative and strengthening of disease monitoring programs. Regulation on Concessions and Authorizations for Aquaculture (Reglamento de Concesiones y Autorizaciones de Acuicultura, 1993, D.S. No 290/1993) - SubPesca and Sernapesca - Licencing. National Environmental Framework Law 1994 (No.19.300) - National Commission for the Environment – CONAMA & COREMA (regional) - Environmental impact assessments and monitoring. Environmental regulations for aquaculture (RAMA), S.D. No. 320 (2001) - SubPesca and Sernapesca - Environmental requirements for approval of aquaculture activities, avoiding and assessing sediment anoxia, established preliminary site characteristics (CPS) for inland and marine sites, establishes annual environmental monitoring as part of the environmental information program. Sanitary regulations for aquaculture RESA, S.D. No. 319 (2001) - Regulation of Protective Measures, Control and Eradication of Diseases of High Risk to Aquatic Species (Reglamento de medidas de protección, control y erradicación de enfermedades de alto riesgo para las especies hidrobiológicas - SubPesca and Sernapesca - Prevention and control high risk diseases in aquatic species. Resolución Exenta N° 1141 del 18 mayo del 2012 - SubPesca and Sernapesca - Sanitary Program of Monitoring and Control of Caligidosis (PSEVC-CALIGIDOSIS). Res. Ex. N ° 1741 - 09.07.2013 - SubPesca and Sernapesca - Classification of high-risk diseases. Authorities are expected to release new regulations to lower production levels imminently (Villegas 2016) . Under the proposed new regulations, producers will be able to opt for a maximum net-pen density less than the current limit of 17 kg/m3 or to allow the limit to vary according to the health condition of the fish (but not to exceed the current maximum). The new regulations were anticipated in 2017, but there is no indication that they have been implemented. In 2015, a 5-year moratorium enacted in 2009 on new licenses in Regions X (Los Lagos) and XI (Aysen) was extended for another 5 years (Cardenas 2015). 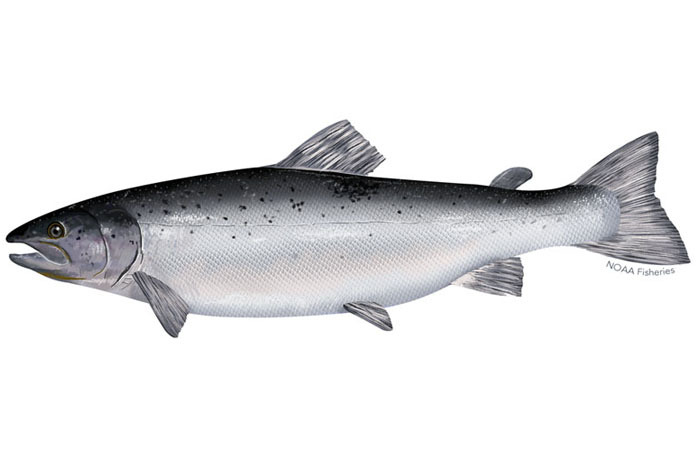 Salmon Industry Association A. G. (SalmonChile) – Major association of Chilean salmonid producers. Established 1986. Members represent 95% of total production. INTESAL (Instituto Tecnológico del Salmón, Technological Institute of Salmon) – Private scientific and technology branch of SalmonChile. ACOTRUCH – established in 2009 by trout and coho salmon producers in order to represent medium and small companies not producing Atlantic salmon. Fundación Chile – Private nonprofit corporation. Created in 1976 by the Chilean government and the US ITT corporation.